My social activities outweigh my game playing lately. Our board game weeknights with friends become more frequent as we add more people to our rotation, and on the weekends we enjoy the new spring-like weather Seattle is finally experiencing after months of gray and gloomy. I am also stuck in a sort of video game rut until Alan Wake is released next week-nothing new sounds terribly interesting and something old continues to keep my attention. Dragon Age is the creamiest and most delicious video game ice cream that I have encountered since the last of the Fable 2 DLC trickled out last year. Normally I am a love-it-and-leave-it kind of gamer-once the credits roll I rarely go back for more. But after finishing the game last week I’ve done a whole lot of pining for more-and luckily the game has been out long enough that a series of DLC is available. They are small mini-chapters priced at only about $5-$15 apiece on the 360 that don’t really add much to the overall story but still give you a few more tasty nibbles to enjoy. I have not yet added Awakening to my DA DLC collection due to the current high price tag ($40) but will no doubt acquire it in the near future. 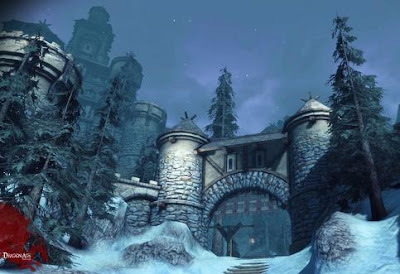 With the Darkspawn Chronicles releasing next week I thought I would review the three I have played so far: Warden’s Keep, Return to Ostagar and the Stone Prisoner. I downloaded Warden’s Keep almost directly after finishing the quest narrative as a sort of medicinal withdrawal preventative. Certain members of my party that I had grown quite fond of were no longer…um… available once the Blight was conquered but were still around to help with the DLC (we’ll call these flashbacks), which I liked. I thought that in a game smart enough to realize that I had laid it down by the campfire with one character after swearing my undying love to another (‘So, um, was that just a one time thing then?’) I might be left with only the surviving characters since I chose to play the extra bits post Blight. Warden’s Keep is a mission to clear out the gathering point of the original Gray Wardens after it’s been overrun with shades and darkspawn. When you get to the creepy tower you find a wild and crazy mage has been experimenting on the evil critters in order to help the research progress. You know, your basic blood mage wackiness. I liked this one because of the alchemical aspects-I am a fan of elemental mysticism and love seeing it in games. I also like the possession demons-based on which way you swing in the ethical world there are always some pivotal choices to make. Kill demon or help demon? I never helped a demon in the game because it went against my characters general demeanor but I plan to join the dark side with my next character to see how it plays out. Overall I thought the ghostly flashbacks were spooky and it was a decent add-on, if a little short at only about 1 ½ hours. The next one I played was Ostagar. A clue sends you on a mission back to the old fighting ground where you find King Cailan’s and Duncan’s gear scattered about. Although the game play is your basic darkspawn killage and character contemplation, the final outcome of the content adds great closure and general wrap-up to the event that kicked off the entire narrative. I admit it sort of tugged at my heart a bit. I don’t want to tell too much about this one because it would spoil any real feelings you may have about the whole situation, but I will say that in terms of character relationship dynamics the end contains one of the best scenes in the game. 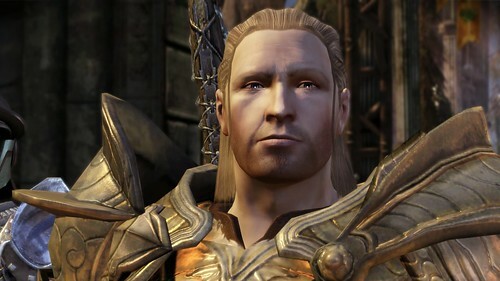 I hear if you take Wynne and Alistair along they spend a lot of time remarking upon the epic battle (I didn't use Wynne). This one took roughly 1 ½ hours as well. My least favorite was the Stone Prisoner. You are asked by a man on Sulcher’s Pass to take a rod off his hands that supposedly has some sort of mystical power. He marks a town on your map called Honnleath where a golem is frozen in the town square. The town is deserted and full of darkspawn. More ethical choices need to be made. The real reward of this one is acquiring the golem as a playable character-which Matt said was entertaining in the Frostback Mtns-but he would have gone unused in my party so the $15 price tag was kind of a waste for only another hour or so of play. By far the best part of the DLC was a cut scene mid travel from Sulcher’s Pass to Honnleath. Normally you find a coven of darkspawn in a copse of trees and a battle ensues. This time you see a crater in the ground with a smoking meteor in the center. An elderly couple stands at the edge contemplating the baby boy they found in the rubble. They decide to take him home and raise him on the farm as their own. Right, Martha? Awesome. My only other video game interactions in the past few weeks were a few chapters of inFamous on the PS3 and the first section of Splinter Cell Conviction. I picked up inFamous on a whim, having nothing else to play. After completing the first few missions in a Crackdown-like environment (add apocalypse, stir) and earning some rank the game auto-leveled me to Hard Difficulty. Wow, thanks! I really thought I would like SCC-I am admittedly the biggest of all Ubisoft fan girls that loves to love everything they release. I thought the level design was pretty and climbing pipes to get the drop on random goons was entertaining. But alas, I am just no good with a gun in third-person shooter environments without auto-aim. I have almost conquered the FPS realm and can handle stealth games if daggers mechanically spring out of my wrists on command. So farewell Sam, maybe some other time. Oh, and farewell Lightning and the gang in FFXIII as well. As much as I enjoyed the first hundred paradigm cycling combat scenes while coasting through the pipe the thought of going back now sounds exhausting. And boring. I’m just going to assume they came out okay in the end. Good job, guys!